This superb tall ship cruise on Royal Clipper showcases the beautiful Balearic Islands with their golden beaches, and picturesque Bonifacio, home to an impressive citadel. 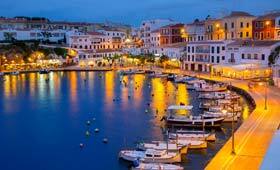 Explore Ibiza, a fascinating island with two contrasting sides, visit enchanting Palma, overlooked by a majestic cathedral, and admire the stunning Georgian buildings in Mahon, the beautiful capital of Menorca. Royal Clipper then sets sail for Corsica, calling at Bonifacio where medieval houses cling on to the steep limestone cliffs. Discover the labyrinth of streets in the historic Old Town or head to the magnificent 9th-century citadel, before cruising to Civitavecchia. Embark Royal Clipper in Malaga. Relax and enjoy the facilities on board Royal Clipper during a day at sea. The Catalan conquest in 1235 was an important date in the town's history. Today, the area is popular with tourists due to its laid back atmosphere and several famous clubs. The island also has a tranquil side, with peaceful unspoiled beaches and beautiful coastal walks. Chief town of the Balearic Islands, Palma is located on the southern coast of Mallorca. In the old part of town are many interesting shops and boutiques, traditional restaurants and its famous cathedral. Mahon, the capital of Menorca, is a charming city with market stalls, shops and an old quarter of Georgian buildings to explore. Discover the island's beautiful crescent-shaped beaches that have beckoned holidaymakers for decades. Medieval houses cling on to soaring limestone cliffs in the beautiful Mediterranean town of Bonifacio. Perhaps explore the labyrinth of charming streets and traditional cafes in the beautiful Old Town, admire the impressive 9th-century citadel or wander around the marina, full of luxury yachts. Disembark Royal Clipper in Civitavecchia.